We would like to inform you that Samara plant Strommashina will take part in the 20th International exhibition of technologies and equipment for mining and processing of minerals to be held in Moscow from April 26 to 28. 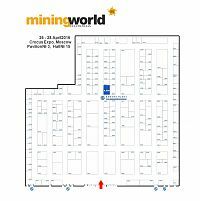 The event has been recognised as the best exhibition in Russia in 2013-2014 in the category "Natural resources, mining and quarrying" in all nominations, according to the Russian National Exhibition Rating of 2013-2014. We invite you to visit our stand № A 905 located in, Pavillion№3 Hall №15.